In mid-May this year, the City of Winnipeg Public Service transitioned from their city-wide spring clean up to parks maintenance activities. Sometimes the transition is smooth, and sometimes, depending on weather conditions, there’s a few challenges. This year, we are experiencing the latter. The 2016 grass cutting season officially started on May 16. The spring grass growth started fairly slowly, and one cycle of mowing was completed. However, recent rainfalls have resulted in accelerated growth of grass. Mowing crews work 8-hour shifts weekdays and overtime as required in order to address mowing needs on a city-wide basis. However, grass cutting operations are being hampered by ongoing rainfall and extremely wet conditions. Under such conditions, mowers can damage grass which results in very costly repairs. Weather permitting, crews will be continuing mowing operations on Saturday and Sunday of this weekend. The majority of public greenspace is mowed on a 10-day cycle, on average. Weather related circumstances and other factors may cause the cycle to reach 14 days. In comparison, regional parks are mowed more frequently than every 10 days. The number of actual cuts per season ranges from approximately 8 to 12. In addition to the rapidly growing grass this spring, recent heavy rains have contributed to the rapid growth of dandelions. The City’s weed control program changed in 2015 due to new Provincial legislation (Non-Essential Pesticide Use Regulation under the Environment Act) which restricts traditional pesticide use on lawns. This means that the City can no longer use certain pesticides on grassed boulevards, parks and athletic fields. This is not ideal for some, but the City is restricted under the new Provincial legislation. Refer to the City of Winnipeg Weed Control website for details. For the last few years, the City has been primarily mowing to control dandelions for the last few years. 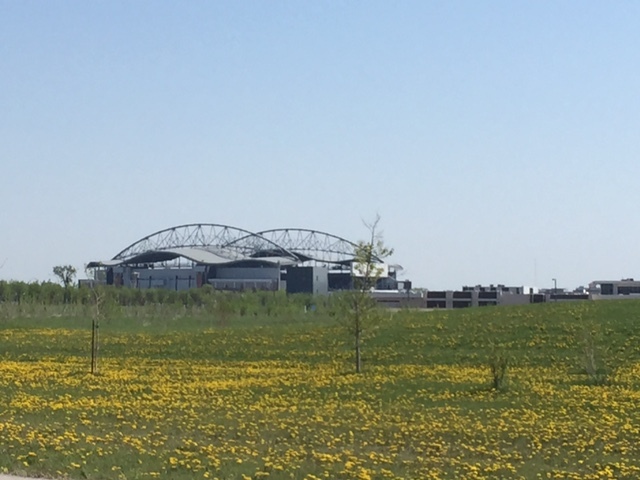 Mowing is the only action the City is taking to respond to dandelions in “grassed areas” and while this treatment has labour cost implications, at this point in time, there are no other cost effective legal alternatives. The City did investigate alternative products to spray on dandelions that were in keeping with Provincial legislation, but the product was about 8x the cost of Roundup and was not being used by any other Canadian city due to overall ineffectiveness. Hard surface areas (non-grassed areas) with weeds or along difficult locations such as fence lines are now being sprayed with acetic acid (Eco-clear or vinegar). This product is nowhere near as efficient as Roundup, but does comply with Provincial legislation. For some great tips on residential lawn/yard care, visit Greenspace – Organic Lawn Care on the City’s website. As the website points out, when it comes to weeds, a little tolerance goes a long way. So if you can’t beat those dandelions, try cooking them! !